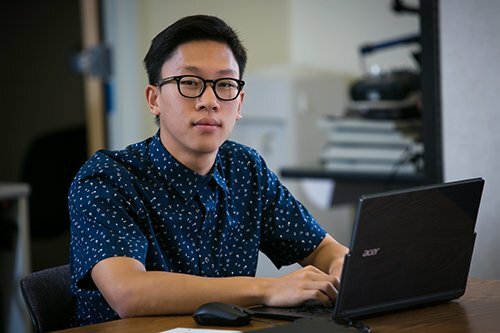 Kevin Lee, a Los Angeles resident minoring in math, will discuss developing a method to merge data from multiple sources in modern computer systems. (THOUSAND OAKS, Calif. – April 11, 2017) Students in the rapidly growing major of computer science will present their work in artificial intelligence, robotics and databases on April 27 at the Science Showcase during California Lutheran University’s annual Festival of Scholars. The Science Showcase Poster Session will run from 11 a.m. to 12:30 p.m. in Soiland Recreation Center and is open to all. It is one of about 40 public events scheduled during the weeklong festival. Cole Elpel of Los Altos Hills will share his work developing an app that identifies fake news. “The aim is to combat the recent issue of fake news via the internet through the creation of an application that compares multiple news sources with one another and attempts to determine what is and isn’t legitimate information,” Elpel said. “Data integration is highly useful for commercial and scientific applications as it allows us to answer questions about data that cannot be answered by one source alone,” Lee said. The number of Cal Lutheran students majoring in computer science and computer information systems has increased six-fold in the last decade to 108 students. “The growth is likely driven by the demand for fresh graduates in the work force and the high salaries for new graduates,” said Craig Reinhart, chair of the Computer Science Department. Nationwide, the number of degrees conferred in computer information sciences more than doubled between 2009 and 2015, according to a 2018 report from the National Academies of Science, Engineering and Medicine. Nevertheless, the report found that the growth in computing jobs far outpaces the rise in the number of students earning bachelor’s degrees in computer science and similar fields. Soiland Recreation Center is located in the Gilbert Sports and Fitness Center on the Thousand Oaks campus. For more information of the Festival of Scholars, visit CalLutheran/fos or call 805-493-3795.